Courtesy photo County commissioners, elected officials and Hidalgo County department heads raise a shovel Friday to commemorate the groundbreaking for the new courthouse in Edinburg. 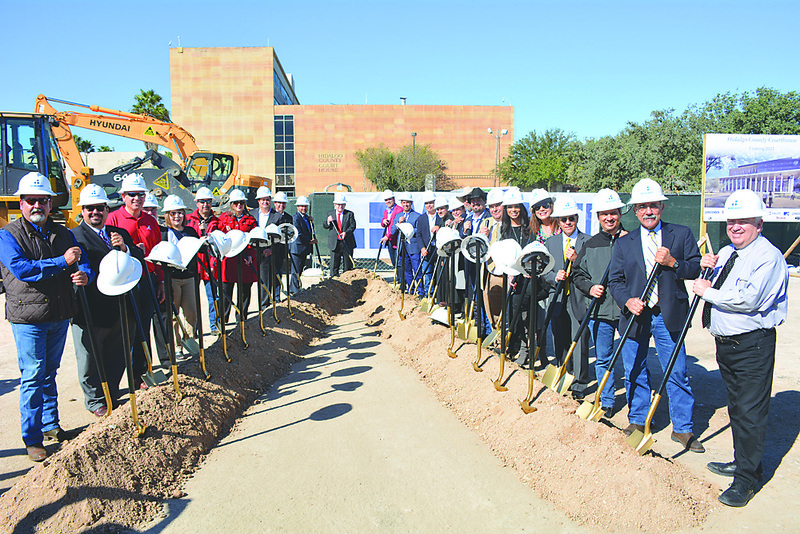 Elected officials and stakeholders gathered Friday morning at the site of Hidalgo County’s future courthouse to ceremoniously break ground on the new $150 million structure. The courthouse is scheduled for completion by 2021 and will sit where a parking lot in the downtown square was once located. Hidalgo County Judge Ramon Garcia said the current courthouse was built with five courtrooms and was meant to serve 169,000 residents. He predicted the 2020 Census will reveal the county is comprised of over a million people. 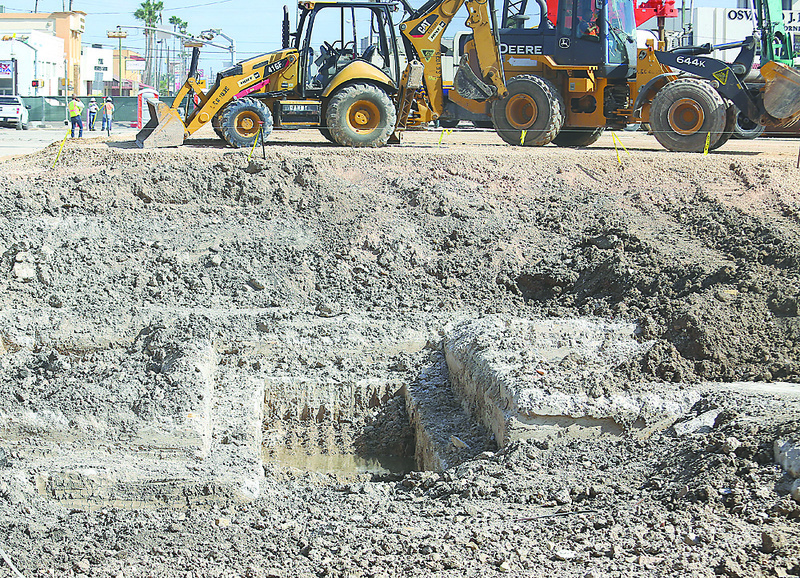 Joel Martinez | jmartinez@themonitor.com The old parking lot area of the square is seen after excavation work for the foundation of the new county courthouse on Nov. 6 in Edinburg. 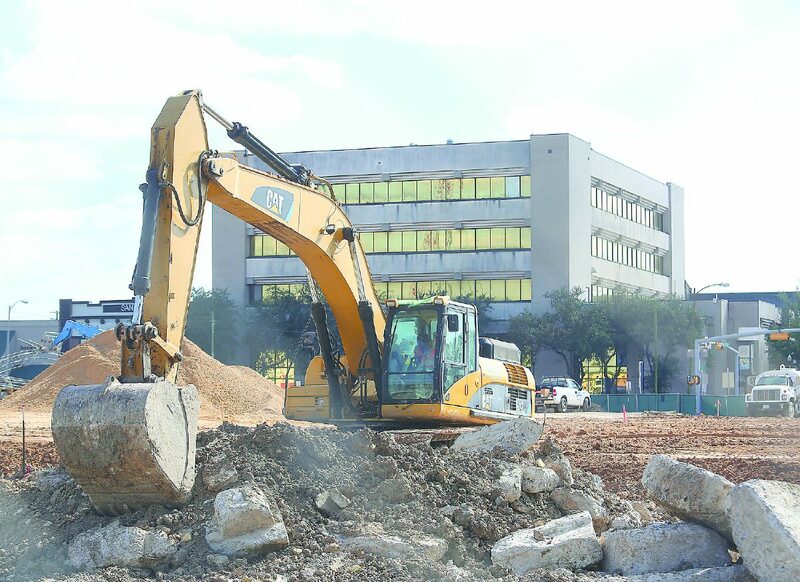 Joel Martinez | jmartinez@themonitor.com Heavy equipment is used to excavate the ground under the old parking lot in the square to begin construction of the new Hidalgo County Courthouse on Nov. 6 in Edinburg. “Obviously, there is a dire need,” said Precinct 4 Commissioner Joseph Palacios, citing population growth. The new, seven-story courthouse will house 24 courts, the 13th Court of Appeals and can add up to eight more courtrooms as needed. He also addressed those who suggested an alternative site for improved access and economic development, referring to an offer of 20 acres free of charge from local developer Kent Burns in his La Sienna Development north of Edinburg. “This is the heart of the city but it’s also the heart of the county,” he said of the location. Speakers acknowledged the work required to secure the deal. He singled out Edinburg city leadership for praise. “It started years ago (and) I want to congratulate past administrations, (and the) current administration,” he said. “Along the way, we’re finding our way through the weeds to work together. Palacios also credited one person that was pivotal for making the new courthouse a reality.